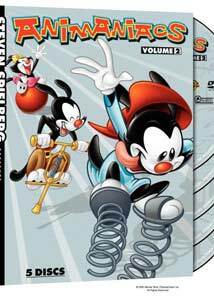 Warner Brothers isn't wasting anytime issuing these multi-disc Animaniacs sets, with this Volume Two release coming just a few months after the first collection. That's great news for fans of this hellzapoppin' homage to the good old days of studio animation that debuted in 1993, itself a very loosey-goosey gathering of assorted characters presented in a format that more closely matches a sketch comedy show than a traditional half-hour cartoon. Within the constructs of each half-hour episode, individual segments could run varying lengths, something that gave the writers a spontaneous flexibility. This new set spans much of the remainder of the 1993 season, with 25 episodes on five discs. The stars here are naturally the whatever-they-are Yakko, Wakko and Dot Warner�with their segments consistently manic, delivering a broad stroke of jokes, songs and gags that were often just as much for the adults as they were for kiddies. Not Family Guy adult, just the type of clever wordplay that a Mom or Dad stuck watching would get a laugh out of while their youngster stuck with it for the physical schtick. Sure, maybe a nurse is drawn a little buxomy (ok, maybe a lot buxomy), but where's the harm? And it was that approach to the writing that made me a fan from the get go, because back in the day when my daughter was a wee one her and I would watch cartoons, and I would much rather have something like the Animaniacs that I could laugh at, too. Things like Dot's Mary Tyler Moore song or a black-and-white Casablanca parody probably won't mean much to kids, but it makes me smile. This is also the show that launched the take-over-the-world antics of lab mice Pinky And The Brain into their own series eventually, and with Volume Two we get one of their finest moments ever on disc two, in Bubba Bo Bob Brain. The jabs at country music are done brilliantly, with visuals like Brain's skinny robotic legs or his Pinky-spoiled attempt to broadcast a mind control song that ranks as one of their funniest bits. Add to that Brain's comment to a Dolly Parton-esque character of "I'd say puberty was inordinately kind to you" reinforces the writers penchant for humor that was meant to cross age groups without being too adult. A few new supporting characters sprout up in this set, most notably trod-upon Charlton Woodchuck and the explosive teenage weirdness of Katie Ka-Boom, not highpoints but easily stronger than any appearance by Good Feathers (pigeons who sound like mobsters!) or the wildly inconsistent Rita and Runt. One of my personal favorites�the character of Mr, Skullhead�gets his first full-length segment in this volume, in a bit that parodies Edward Scissorhands. Again, not the most little kid-friendly film ever made, but one that gives this series that little something-something for the grownups. Yes, I'm a grown man and I like cartoons. Sue me. Image Transfer Review: The fullframe transfers on this set look slightly cleaner overall than on Volume One, with much less noticeable dirt and debris. Colors, however, look very bright, though edges come off rather soft. The transfers aren't flawless (there is some specking here and there), but they look generally more than presentable. A big improvement over Volume One, and that's a good thing. Audio Transfer Review: Just like Volume One, the Dolby Digital 5.1 surround track is what it's all about, showing great expanse for all of those great old-school-styled Warner Brothers orchestral moments and the multitude of sound effect cues. Not a whole lot of directional movement, but voice quality is strong and clear, with enough rear channel cues to give this a big, full-bodied feel. A somewhat less robust English 2.0 surround mix is also provided. Extras Review: The packaging features a thick cardboard slipcase with embossing for the Yakko, Wakko and Dot illustrations, and a foldout case that holds the five discs. And it matches Volume One, so I'm happy. Aside from a few trailers, the only extra shows up on disc five. It's The Writers Have Flipped, They Have No Script (29m:04s), hosted by Maurice LaMarche, who talks to a panel group of writers/producers, featuring Paul Rugg, Sheri Stoner, John McCann, Peter Hastings, Charles Howell, Gordon Bressack, Earl Kress, Tom Minton, Randy Rogel, Nicholas Hollander, Tom Ruegger and Deanna Oliver. Plenty of great anecdotes, with talk of the whole sketch comedy element, which gave them a large sense of freedom in the show's structure, as well as comments on the accidental development of catchphrases, their favorite episodes and the like. Plus, there's a nice discussion on one of the great eps, Bubba Bo Bob Brain. Each 22-minute episode is cut into four chapters, with optional subtitles in French or Spanish. Should a guy in his forties still love cartoons? Who cares? This is just too much fun.